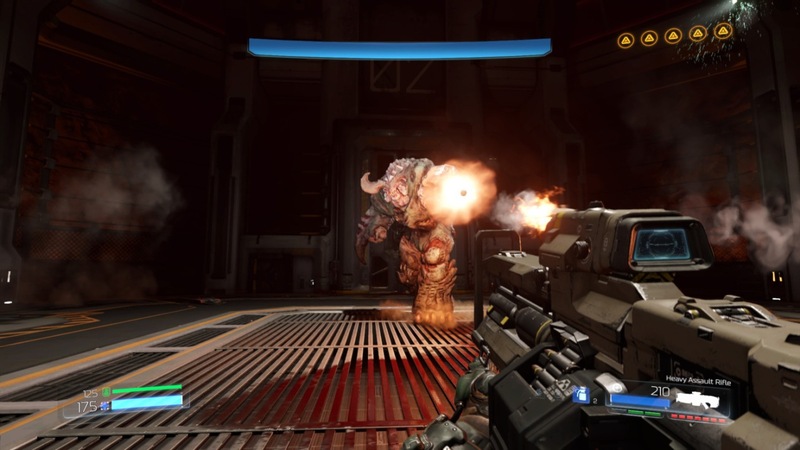 Doom is a blast to play. It really is that simple. Even though the franchise has been around for almost a quarter of a century, while almost stubbornly refusing to change its core formula, it still works. When it comes to expectations, there are no surprise twists, this game is about grabbing a shotgun and killing as many demons as possible. No series does it better. Seldom do I make a big deal out of a soundtrack but in this case I am going to lead off with it. It fits, which is the biggest compliment I can give it. They must have known that nothing would get the blood pumping and adrenaline flowing like a metal influenced musical score. This game is all about frantic pacing, so when you are being chased down by swarms of enemies with fire billowing all around you, the sounds of powerful guitar riffs and heavy drum work add beautifully to the overall sense of urgency. Of course that sense of urgency is primarily reflected in the gameplay. It is a first person shooter in the purest, simplest form. No relying on heavy gimmicks, deep narratives or brain twisting puzzles. Variety comes from the healthy amount of guns the player is given and all of their secondary firing abilities. Luckily, the game is not shy about providing more than a legion worth of demons to use as target practice. In fact, the closest thing to a puzzle you will stumble upon is the requirement to track down a key card in order to open a locked door, it’s iconic to the roots of the series and it just wouldn’t have been Doom without it. My only real gripe with the gameplay came from the heavy use of kill rooms and even that faded as I got further in. This was probably because the areas became progressively larger, combined with the variety of ways to make demons explode, I felt much less boxed in than with other titles that use the mechanic. A note for some of the younger or less traveled players; there is no run button or rebounding health, two things that have become almost default in the current gaming world. So while health and armor pickups are rather generous, at least on lower difficulties, players will always be forced on their toes, moving quickly and thinking strategically. 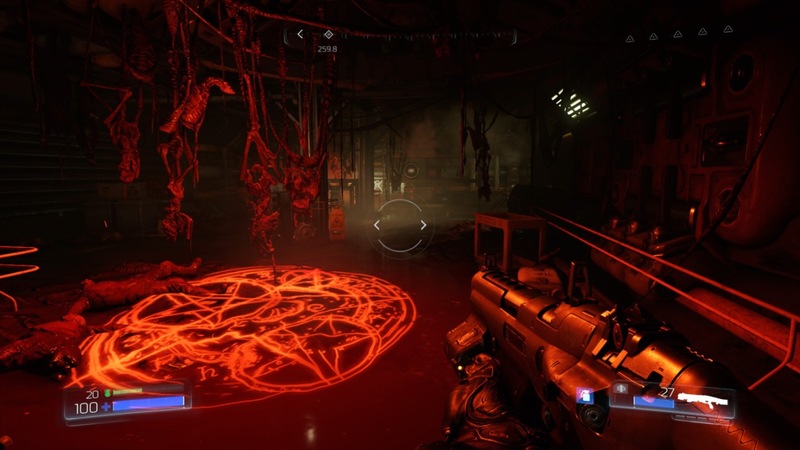 Honestly, even if you could duck behind cover in order to gain back some health, the enemy AI and fast paced nature just means that those demons are probably turning the corner right along with you. As for the run button, I didn’t miss it for long. The game moves at such a fast pace and the protagonist practically glides across the blood soaked battlefields in a way that I never felt like I was going too slow. When your main hope for survival is your quick reflexes, it is paramount that the game reacts as quickly as you do. 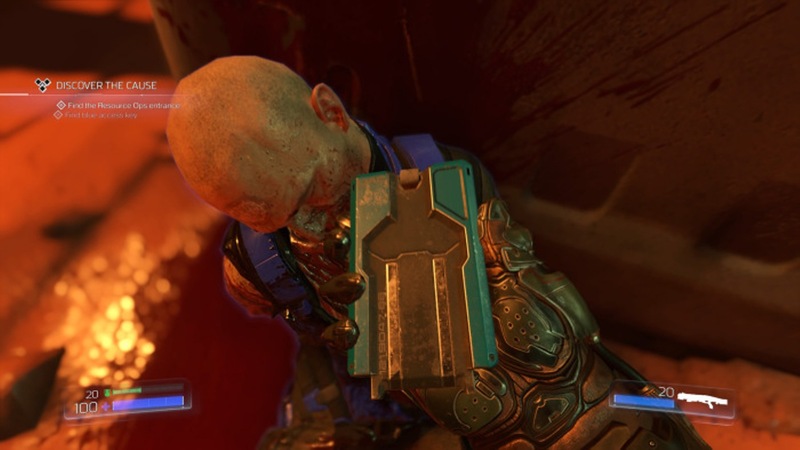 Fortunately, that’s another thing that Doom does extremely well. The controls are near perfect for a twitch shooter and were rarely, if ever, the reason that I was looking up at a respawn screen. This brings me to the narrative, which takes a noticeable backseat in this one. Humanity back on Earth is facing an energy crisis and time is running out. This leads us to a research facility on Mars, the main setting for the game, where the Union Aerospace Corporation believes they have found a solution. A very potent power supply is being drawn through a portal they have opened to Hell. Due to a series of events, Demons begin an invasion by flooding through the portal because they are obviously not one way roads. There is an attempt made to flesh out the plot and fill in the few characters origins but it really isn’t necessary. In order to enjoy this title, people just need some level (no matter how slight) of motivation to start swinging a chainsaw in a bloody spectacle. In that regard, it is just fine but because of the bar being set so high elsewhere, the story ends up being the weakest aspect of the main campaign. I say main campaign intentionally because that should be the only reason someone goes out and grabs this title. The multiplayer and snapmap features are lacking. In regards to the multiplayer, there is nothing inherently wrong with it from a design or technology stand point but it is painfully cookie cutter. It would have been amazing in the Unreal Tournament and Quake multiplayer heydays but with the constant evolution and expectations of multiplayer experiences there is no reason to play this one over it’s more feature rich contemporaries. The population seems to have realized it as I found matches of 12 players wouldn’t be full until halfway through with people dropping in and out randomly. Snapmap on the other hand is done very well and could have been a huge draw for the game. The tools are extensive, elaborate and varied enough for people to make some very unique single player and multiplayer maps. However, the learning curve and dedication required to see those results is deep and as such this feature is dead due to lack of use, at least on the consoles. Lastly, this game is gorgeous. Everything from the environments to the enemies is well detailed and appropriately grim and gory. 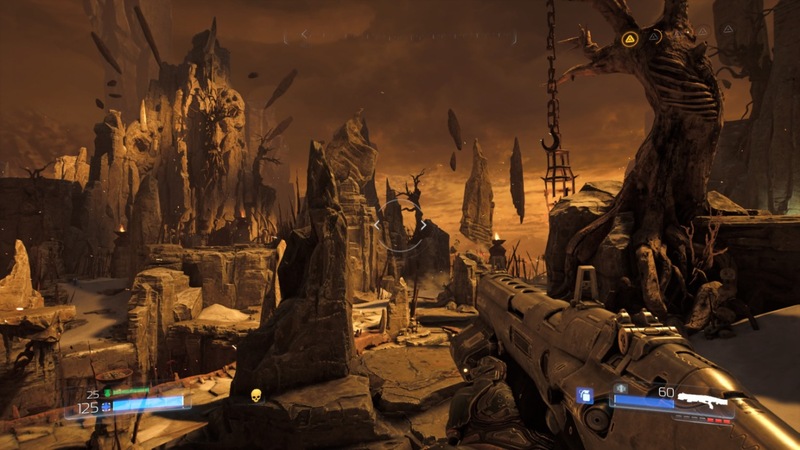 Mars for example, is loaded with the dark corridors, lived in feeling research facilities and vulnerable open areas that made Doom what it is today. The enemy and boss types are fairly limited but they are handled in a way that they are always coming at you in large, varied pack so that you never feel like the game is just recycling assets at you. With all of the talk about the fast pace there might be concern over performance but I can assure you that framerate, texture pop in and draw distances were never an issue for me. The game always ran at a smooth clip and if there was any hiccup then I have to apologize for not noticing it because I was too busy being knee deep in a demons remains. If you haven’t guessed by now, I am strongly recommending this game. It’s not difficult to see why it is climbing current gen top game lists. The focus was clearly never on it being an innovator for the industry but simply making a solid, complete game where all of the elements fit together and perfectly play off one another.